Hello Beauties! So today I thought I would do a little 'Face of the Day' post as I haven't done one of these in what feels like forever. I also decided to put together a little 'step by step' pictorial to help any of you wanting to recreate the look, although I'm not too sure if it's worked or not, so make sure to let me know in the comments if this kind of image is useful in a FOTD post! If any of you have been following me from the beginning, then you'll already know about my love for purple eyeshadow. It's a shade which a lot of people shy away from in favour of neutral eyes, however If you've got green/olive eyes like myself, then I urge you to try it out - it really makes your eyes pop! To start off, I prepped my eyes using my MAC Prep & Prime Eye Base to cancel out any redness on my eyelids and to make sure that my make up stayed in place all day. I then applied the shade 'White Chocolate' from the Too Faced Chocolate Bar palette all over my lid and took it right up to my brow bone (you can use any light matte shadow for this). For the main colours in this look, I used a Dior palette called Petal Shine, which is unfortunately discontinued, however they are doing one at the moment called Femme Fleur which is very similar to the Petal Shine palette, or if you want a more budget option, e.l.f do a 'Little Black Book' eyeshadow palette which has all of the purple shades you'll need for this look plus loads more. Firsty, I applied a purpley mauve colour through my crease and blended out, then I applied a lavender shade over my lid to brighten my eyes and make them stand out a bit more. Next I took a detailer brush (any thinner eye brush will do) and applied a dark violet shade just under my lower lash line and in the outer V of my eye, then I took a clean fluffy brush and blended this all out to create a softer look. 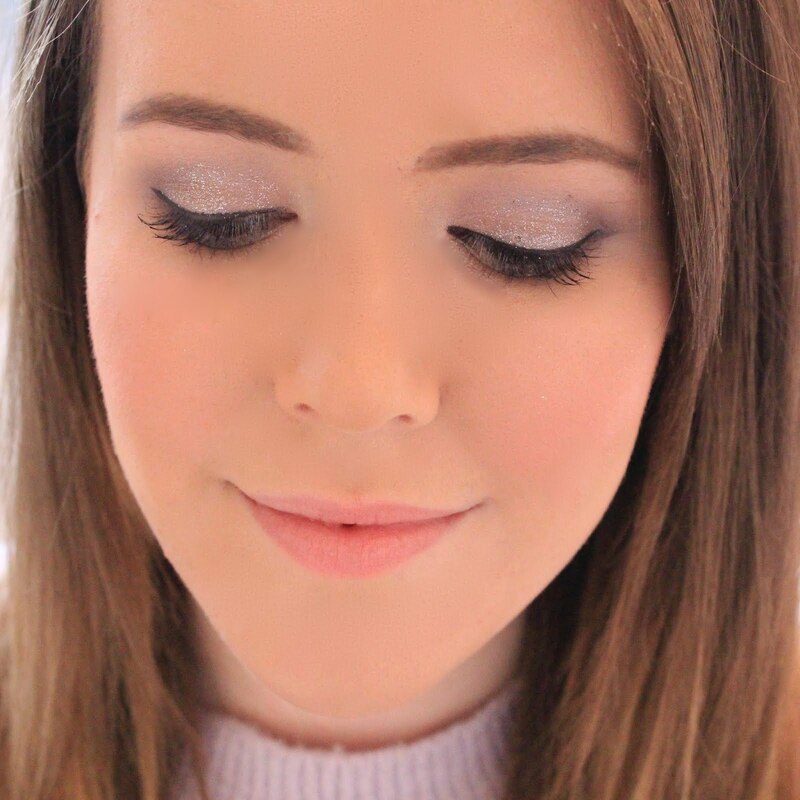 Now you could leave this eyeshadow look there, which I usually do, however if you're going to an event or night out, a little glitter never goes amiss! For this I used some extra fine silver glitter which you can purchase from any fancy dress shop. To make the glitter stick to my lids, I first applied a tiny bit of MACs Mixing Medium - or you can use eyelash glue - and then dusted the glitter over my lids. Obviously, this will create a heck of a lot of fall out so I advise doing your eyes before your foundation for this look. To finish off the eye look I applied the Benefit They're Real Push Up Liner and Maybelline The Falsies mascara to curled lashes. I hope you liked this make up look! If you have any suggestions of make up looks you'd like to see me do or any celebrity make up you'd like me to do a tutorial on, then please leave a comment below letting me know so I can get to work on them! You look beautiful, your eyes are so pretty! You look so so pretty! I really love this soft makeup look. Would love you to stop by! This is such a stunning look! Lavender on the eyes is so pretty. Such a gorgeous look. I need to brave lilac colours more, but my overusing during my teens put me off! This one of my favorite looks ever, I love the softness and the sweet light shade. Really pretty, can't wait to do it on my eyes.